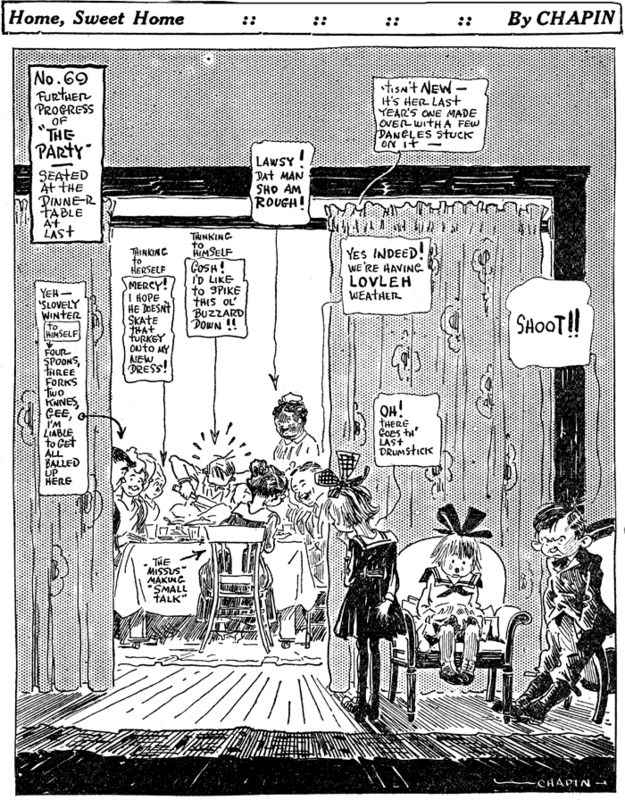 Monday, May 25 1908 -- It is hard to imagine Los Angeles being such a small community that its rod and reel club was considered news enough to rate a Herriman cartoon. But it was. Allan ~ According to records LA had 425,000 residents in 1908. It sure was a different world then! From your research its plain that Herriman went on a lot of these "small town" assignments. They add significantly to our understanding of LA as it transitioned from a prosaic village to teeming metropolis. Thanks, Allan! Connie, August 16 1936, courtesy of Cole Johnson. Follow the Connie story every Friday here on Stripper's Guide. Among the many different series to bear the title Home Sweet Home we have this real obscurity by A.B. Chapin. 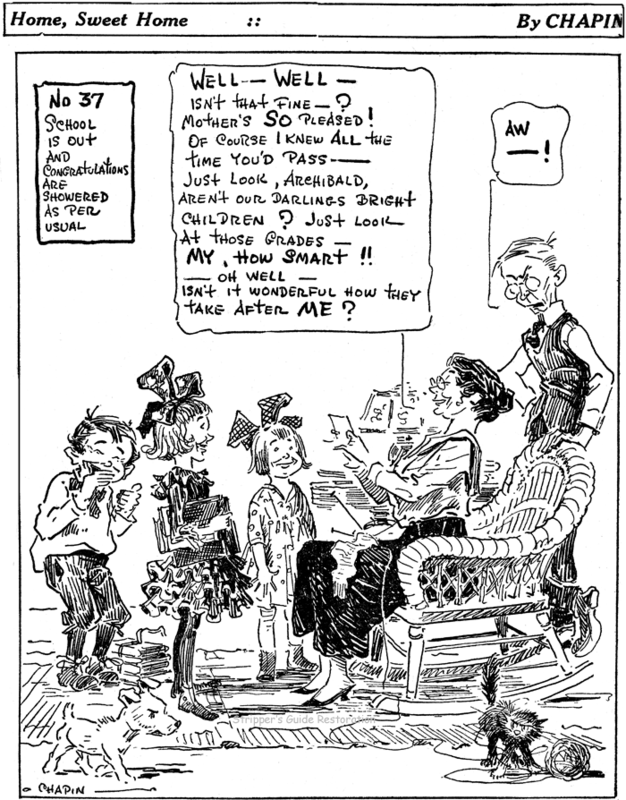 In 1917-1919 when Chapin was the editorial cartoonist of the St. Louis Republic, he took Mondays off from the woes of the world to chronicle a family's doings under this title. Although I only have a handful of samples of this rare series, Chapin was good enough to number his episodes so that I can say that the series began on or slightly before September 17 1917 (I say slightly before because I can also tell from the numbering that on rare occasions the feature missed a Monday appearance). 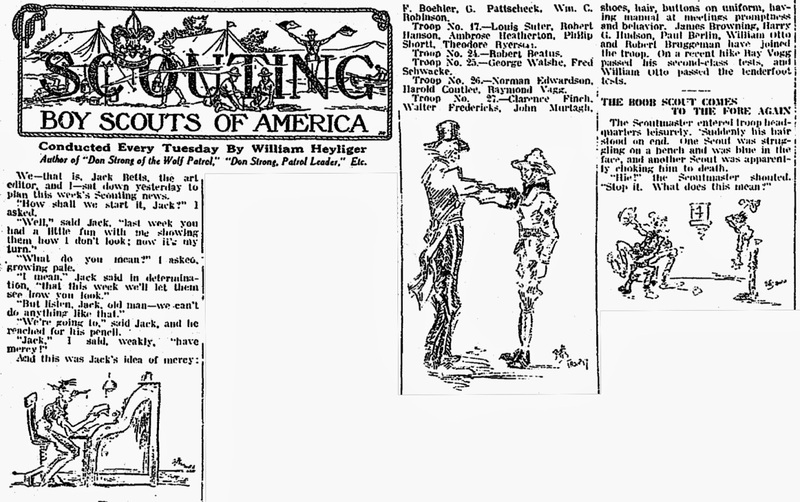 My last sample of the feature is from March 10 1919, but Chapin may well have produced it for the Republic until the paper itself folded in December of that year (Chapin may have bailed out earlier than that, though). Chapin's delightful artwork -- sort of a mixture of equal measures Dwig and Ding Darling -- makes this basically ho-hum effort really stand out. Lovely stuff! More tomorrow, as Alex Jay contributes an Ink-Slinger Profile of A.B. Chapin. John George “Jack” Betts was born in New York in 1904, according to a family tree at Ancestry.com. His parents were Steven H. M. Betts, a machinist, and Alice Ethel Stevens, who married October 1, 1901, in Jersey City, New Jersey. Betts’s father was born in Brooklyn, New York, which was his residence in the 1900 U.S. Federal Census. Betts’s sister, Ethel (1907–1982), was three years younger and born in Brooklyn. Presumably, Betts was also born in Brooklyn. In the 1910 census, Betts and his sister were living with their maternal grandparents, John and Anne Stevens, whose two sons, daughter and daughter-in-law were part of the household. They resided in Jersey City, New Jersey, at 257 Union Street. The family tree said Betts’s mother had passed away February 9, 1910 in Brooklyn, New York, about two months before the census enumeration (April 15). Betts was six years old at the time. His father has not been found in this census; he passed away in 1970. Betts’s education and art training was in Jersey City. 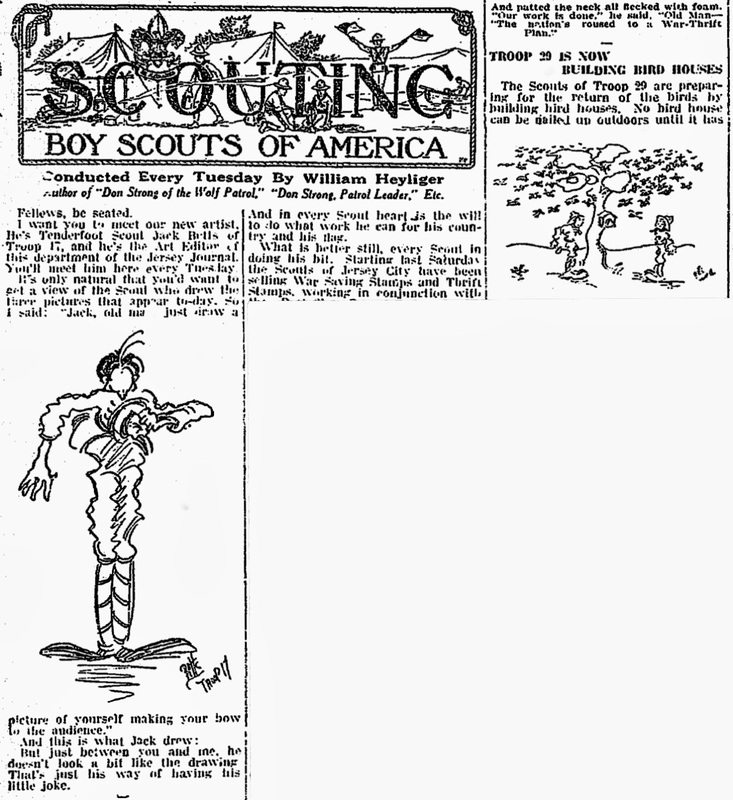 He was a Boy Scout who contributed spot illustrations to the Jersey Journal’s “Scouting” column. His debut was March 26, 1918. I want you to meet our new artist. He’s Tenderfoot Scout Jack Betts of Troop 17, and he’s the Art Editor of this department of the Jersey Journal. You’ll meet him here every Tuesday. But just between you and me, he doesn’t look a bit like the drawing. That’s just his way of having his little joke. 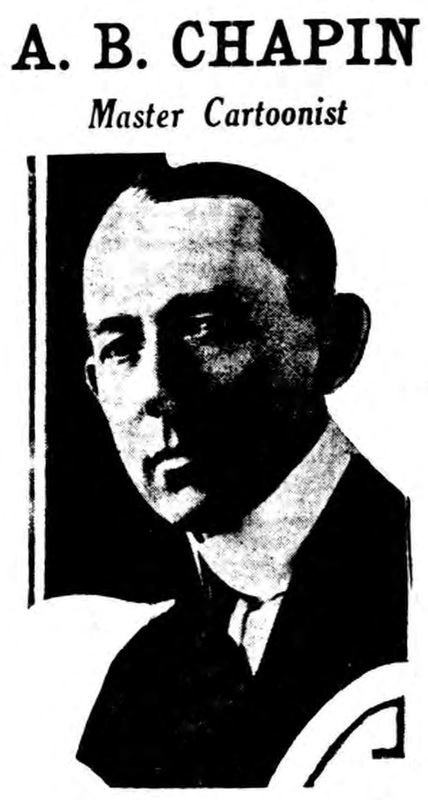 Below is a detail of the column from the April 2, 1918 issue. We—that is, Jack Betts, the art editor, and I—sat down yesterday to plan this week’s Scouting news. “How shall we start it, Jack?” I asked. “What do you mean?” I asked, growing pale. “We’re going to” said Jack, and he reached for his pencil. 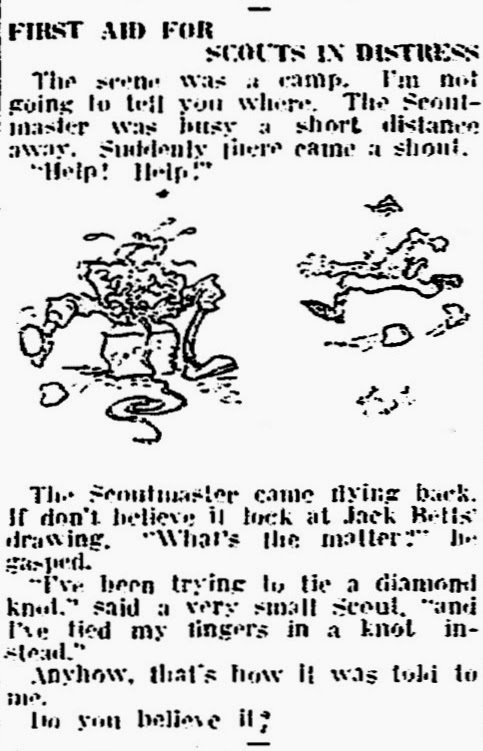 The spot illustration, below, was published in the April 30, 1918 column. Since I told you last week that Troop 17 was going to go farming, I’ve been hearing every day of Scouts who are going to go forth and tackle the pesky cut worm, and the cabbage worm, and the ferocious potato bug. 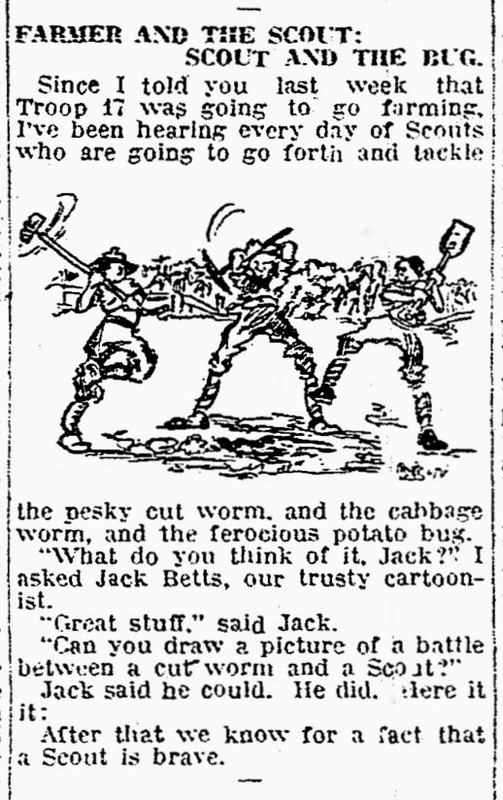 “What do you think of it, Jack?” I asked Jack Betts, our trusty cartoonist. After that we know for a fact that a Scout is brave. 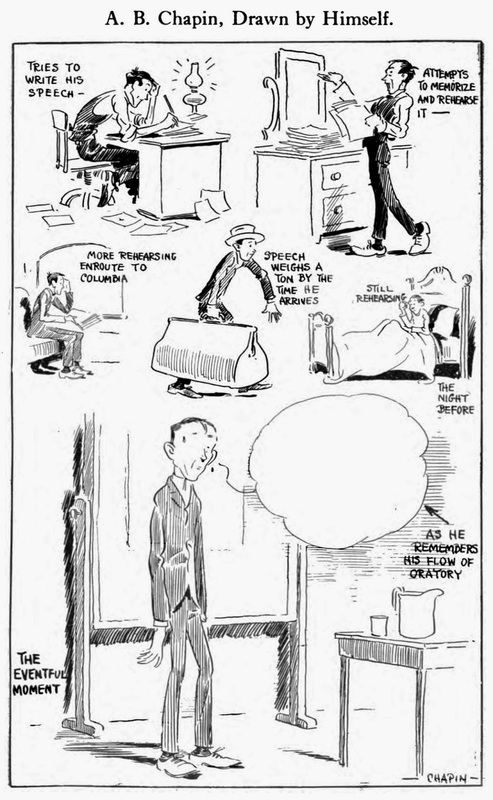 One of Betts’s drawings earned him a mention in the national periodical, St. Nicholas, February 1919. In the 1920 census, Betts’s maternal grandmother was the head of the household which included two of her children and her two grandchildren. They lived in Jersey City at 219 I (eye) Avenue. Betts was 15 years old when the enumeration was done on January 15; based on the enumeration dates of the 1910 and 1920 censuses, his birth day was after January 15 and before April 15. The census recorded his name as John. At this time, very little is known about Betts in the 1920s. He married around 1925 and was credited for an illustration in the October 1928 issue of College Life. According to the 1930 census, Betts was married to “Ester”, a Swedish emigrant, and had two children, Joan, age four-and-a-half, and Jack, age one. They resided in Jersey City at 37 Clendenny Avenue. His occupation was artist at an advertising agency. 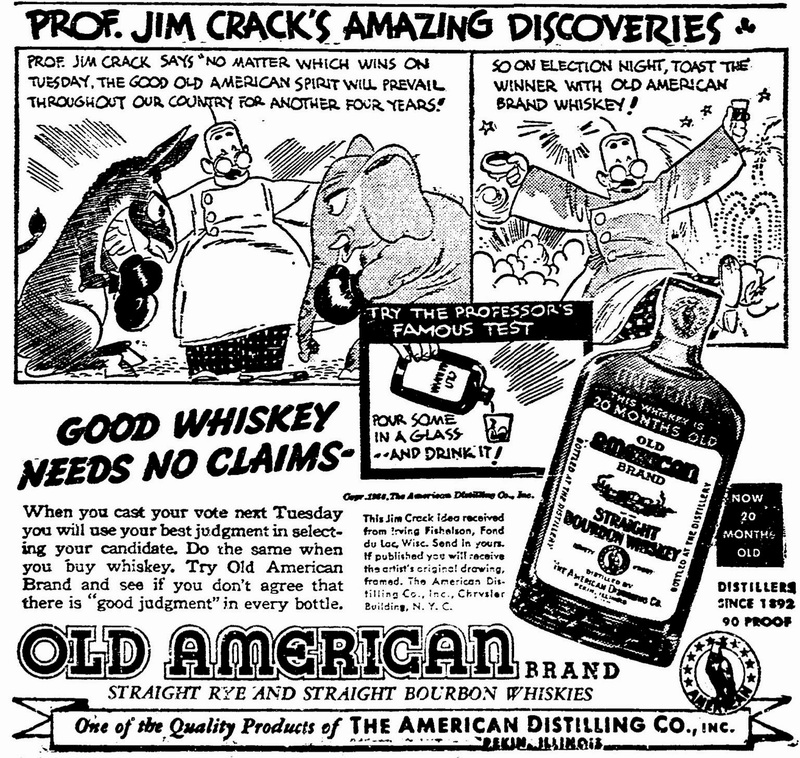 In October 1936, the American Distilling Company launched a major advertising campaign to promote its Old American Brand whiskey. 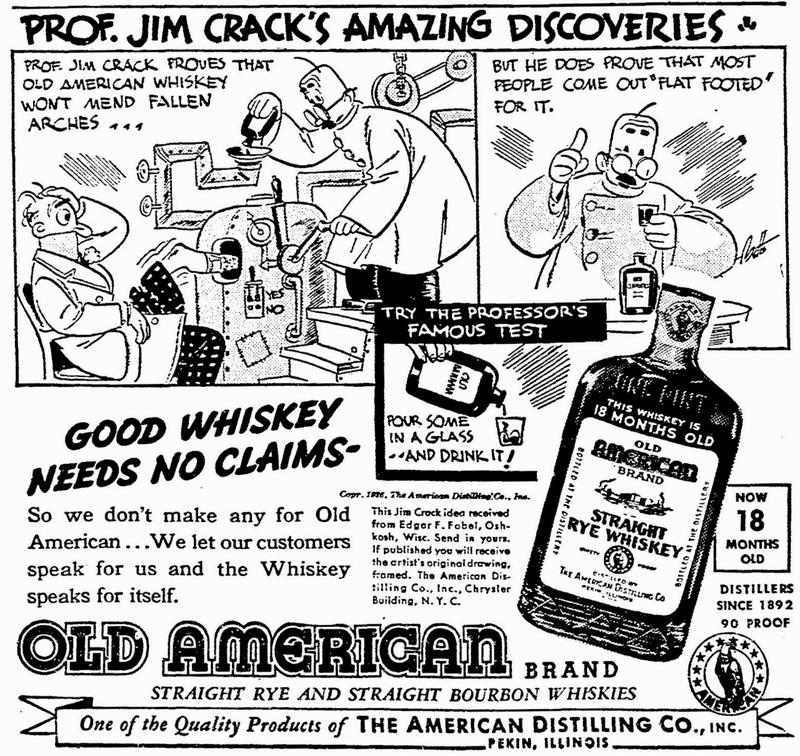 Betts illustrated the two-panel advertisements which featured “Prof. Jim Crack”. 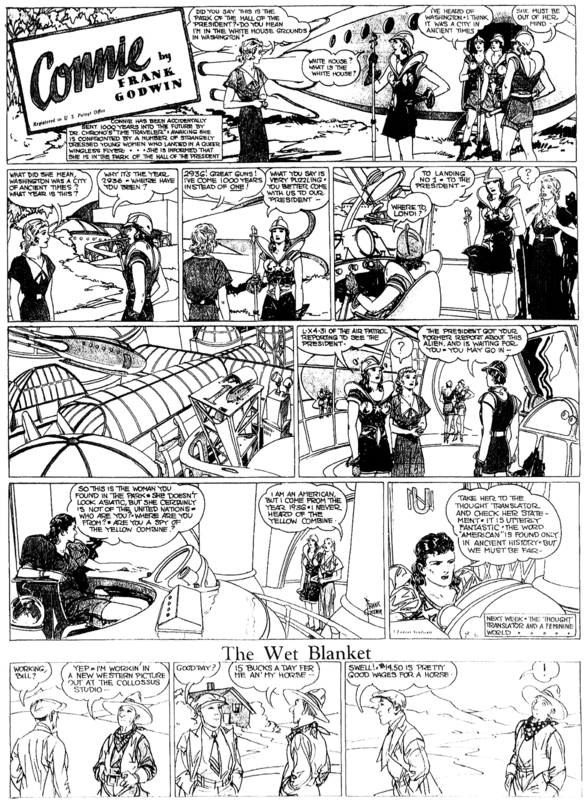 The advertising agency Hanff-Metzger created the campaign, which was copyrighted and recorded in the Catalog of Copyright Entries, Part 4, Works of Art, etc., 1936 New Series, Volume 31, Number 3, on pages 135 and 139. The New York Times, April 29, 1939, noted that Betts leased an apartment at 2 Horatio Street, and that was his address in the 1940 census. This was the first time his name was recorded in the census records as Jack. His occupation was freelance artist and he had completed three years of high school. His second wife’s name was listed as “Trixe”. Betts’s first wife and children lived in Miami, Florida. The 1940s was a busy decade for Betts. He produced advertising comics for Ben Gay, Nestlé, and Super Suds. A World War II military service record for Betts has not been found. He illustrated the poster Don’t Fall for Enemy Propaganda which can be viewed here and here. The New York Times, April 15, 1944, noted Betts’s new business arrangement: “Bruce Stevenson, artists’ representative, will move his studio to 415 Lexington Avenue on May 1. Noel Sickles and Jack Betts have joined his staff.” Stevenson advertised in 26 Annual of Advertising Art (1947) and 28 Annual of Advertising Art (1949). Betts’s listing in the Official Directory, American Illustrators and Advertising Artists (1949) said: “Jack Betts 2 Horatio St. CH 2-1927 New York 14, N. Y. Humorous Illustration, Continuities. Rep. Bruce Stevenson”. 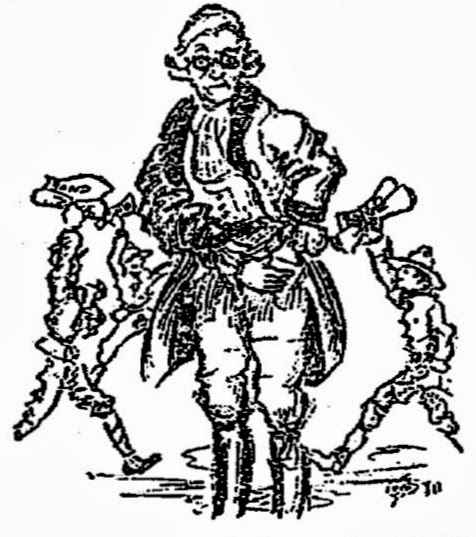 Betts was one of the artists who illustrated the adaptations of Book-of-the-Month Club novels that appeared in newspapers. In 1946 he drew the panels for Britannia Mews. 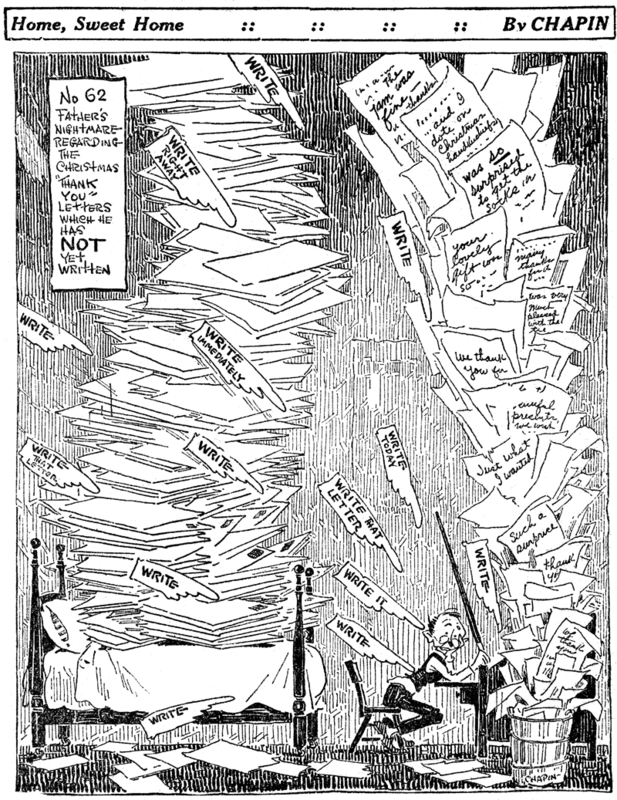 Betts drew spot illustrations for several magazines including American Legion, Collier’s Magazine’s “Keep Up with the World” column, This Week Magazine, and Bluebook. The books and pamphlets Betts illustrated include Footprints of the Trojan Horse (1942), I Am an American (1946), New Footprints of the Trojan Horse (1952), and Who? Me? (1954). A 1957 Manhattan, New York City directory listed Betts at 2 Horatio Street. According to the family tree, Betts passed away in 1966. An obituary has not been found and there is no record of him in the Social Security Death Index. A photograph of Betts and a greeting card by him can be viewed at Fabulous Fifties. Nice... lot's of stuff I didn't have. Betts daughter told me he died in the late fifties. 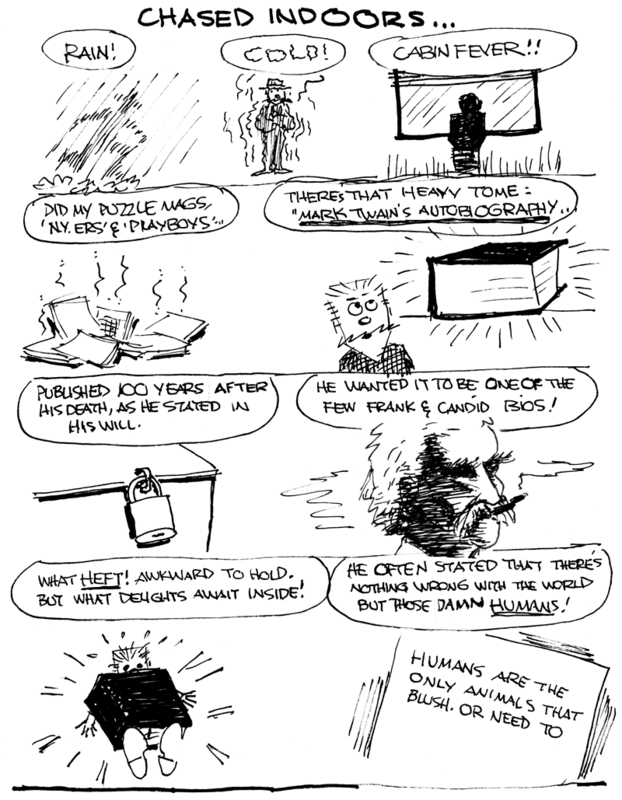 This does coincide with the disappearance of his work around that time. But it doesn't fit with the fact that neither Tom Schreuer nor Leonard Starr knew about him, although all of them worked at Johnstone and Cushing in the late fifties. I'll contact Alex privately about all of this. I have found a Jack Betts dying on March 8 1957 at age 53 in New York. Could be our man. Fits with what the duaghter told me. https://health.data.ny.gov/Health/Genealogical-Research-Death-Index-Beginning-1957/vafa-pf2s/data. So where do I go from there to more? Oh, sorry. It's the third of August 1957.I now have the State file number and would like to see the death certificate. Can that be found? If Betts was born outside of New York City, you should be able to obtain a death certificate. The Municipal Archives maintains records of births reported in the five Boroughs of New York City (Manhattan, Brooklyn, Bronx, Queens and Staten Island), prior to 1910; deaths reported prior to 1949; and marriages reported prior to 1950. For a complete description of the vital records collection, please see a list of the Municipal Archives Holdings. Vital record copies are $15.00 each; see complete fee schedule. 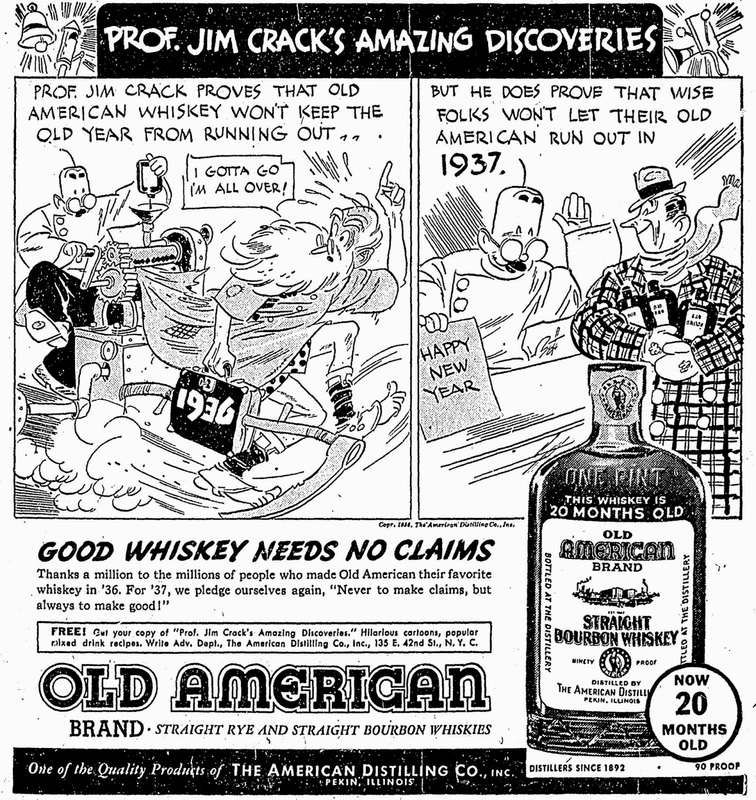 If you don't haunt the old newspapers like I do, you might be surprised at how many advertising campaigns for liquor involved comics. Take my word for it, though, the liquor folks definitely liked cartoons for selling their wares. 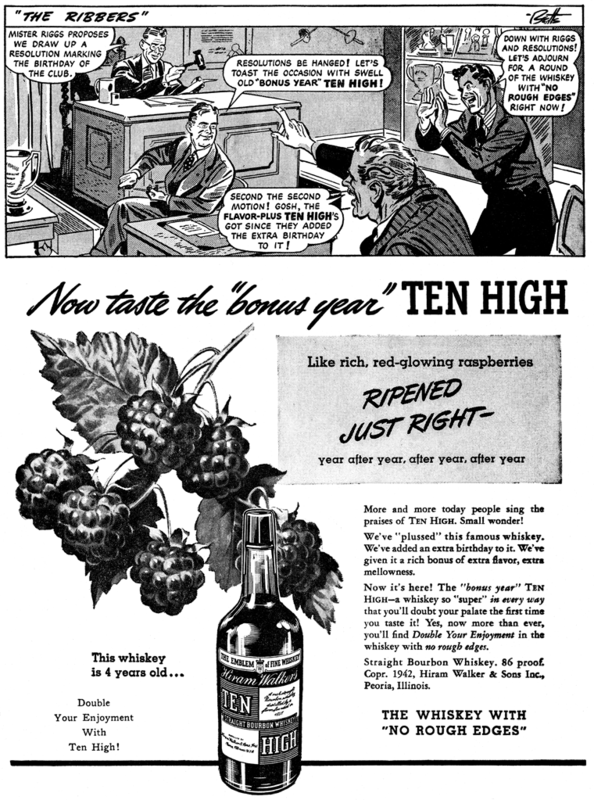 The Ribbers, for instance, hawked whiskey for a couple of years at least in the early 40s. 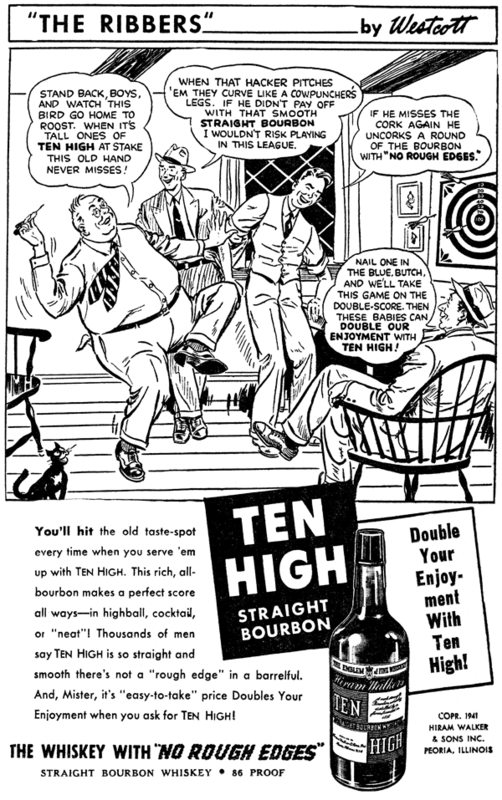 This particular hootch they shilled for was called Ten High Bourbon Whiskey. I'd never heard of it, but according to Wiki it used to be one of the most popular brands. Gosh, I thought Wild Turkey, Jim Beam, and so on, but what do I know. Anyways, The Ribbers concerned a group of guys typically engaged in good American manly activities. 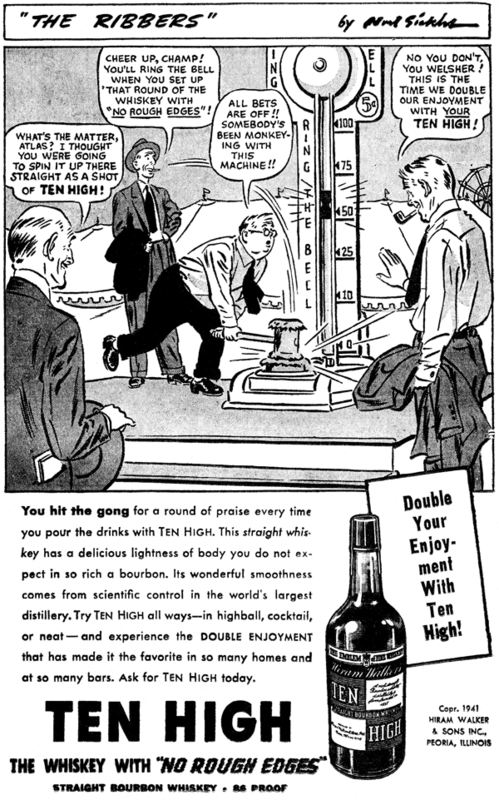 They all incessantly discuss the wonders of Ten High Whiskey, and how they just can't hardly wait for their next tipple of the whiskey with "no rough edges". Although the characters usually look about the same from ad to ad, the names change each time. But all those characters had one thing in common, and that was the love of putting the screws to the fat member of their little love-in. 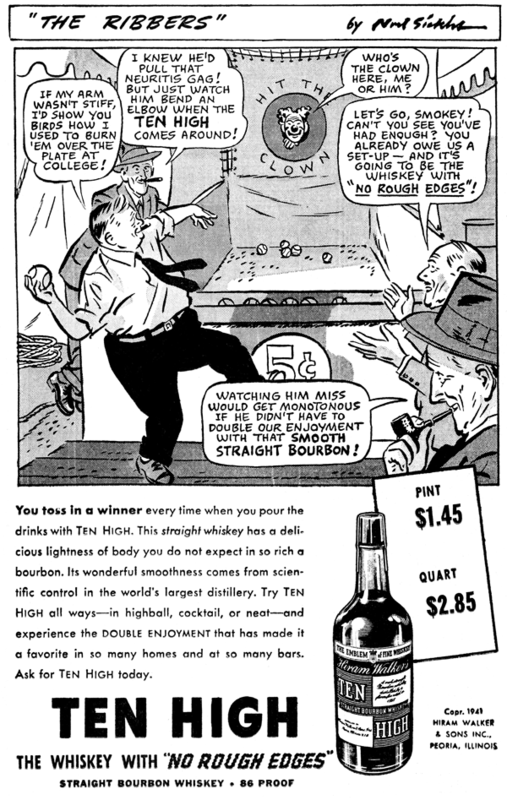 In most of the ads the fat guy is in the process of losing some bet that will have him buying the next round of Ten High giggle juice. These guys were mean drunks. The first artist on The Ribbers, which seems to have begun around mid-1941, was a fellow who signed himself Westcott. He didn't seem to last for very long at all until he was replaced by the great Noel Sickles. Sickles, unfortunately, wasn't moved to create any particularly memorable art for this campaign. 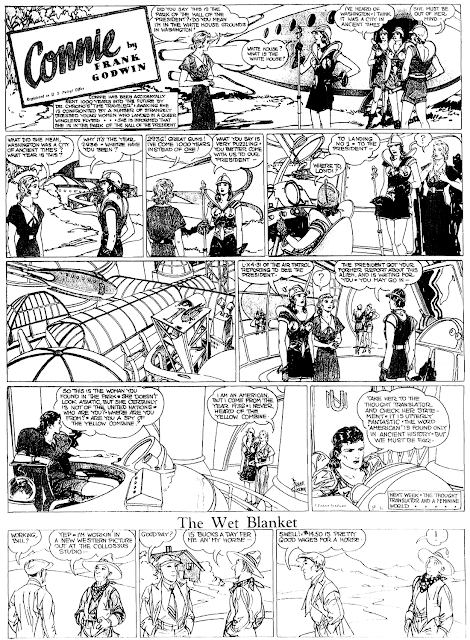 In fact his panels are hard to tell from Westcott's. Sickles handled the art chores until early 1942, and then Jack Betts took over. We'll learn about Betts tomorrow from Alex Jay's Ink-Slinger Profile. I've never seen any ads later than March 1942. I presume the ad budget was cut when it became clear that the war was more than enough stimulation for liquor sales without the dubious help of The Ribbers. I have a room full of books waiting. I'm always reading one. I look forward to days when I can just read the day away!